Beating the Odds’ by Roadtrip Nation follows the journey of three students who have overcome challenges to make it to college as they meet successful professionals, including former First Lady Michelle Obama, who share their own stories of growth through adversity. Costa Mesa, Calif., June 4, 2018 – Beginning June 3, a new one-hour documentary special, “Beating the Odds,” will be streaming at beatingtheoddsfilm.com and air nationally on public television. Produced by career exploration nonprofit Roadtrip Nation, and presented by KQED, “Beating the Odds” follows three college students as they explore careers through a series of interviews with remarkable professionals who have overcome life challenges to succeed in their fields. The college students are overcoming obstacles of their own, including opioid-addicted parents, navigating the foster care system, and surviving poverty. Supported by ACT’s Center for Equity in Learning, with advisory support from the Better Make Room campaign, “Beating the Odds” explores the ways in which people overcome tough circumstances, make it to and through college, and gain resilience through hardship. The film follows James “Ikie,” Estephanie, and Esther as they travel from Long Island to Los Angeles in Roadtrip Nation’s green RV. The film features actors, politicians, athletes, and educators, all of whom are now dedicated to improving pathways to make the world a better place for those who need it most. The roadtrippers cross paths with former First Lady Michelle Obama; author and foster care advocate Ashley Rhodes-Courter; the first openly gay mayor of Long Beach, California, Robert Garcia; actress and producer Elaine Del Valle; and Paralympian track star Scout Bassett, as well as other inspiring individuals. “Beating the Odds” roadtripper “Ikie” hails from West Virginia coal country, where his father became a casualty of the opioid crisis and where he attends college. He is studying political science in hopes of alleviating the problems facing his community. Esther grew up struggling with depression and anxiety as she made her way through the foster care system. She was adopted into a loving family and doesn’t want to let her past limit her as she studies theater and elementary education. Estephanie was raised by a single mother in the Bronx, where financial hardship was an ever-present reality. She is dedicated to turning her love of dramatic performance into a viable, fulfilling career. Ultimately, these three young people hope that sharing their stories can inspire other students who are facing similar obstacles. 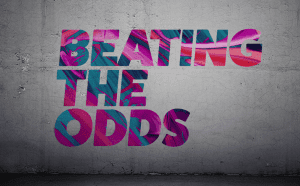 To learn more and watch “Beating the Odds,” visit beatingtheoddsfilm.com and follow @RoadtripNation, @ACTEquity, @BetterMakeRoom and the hashtag #BTORoadtrip on Twitter. Roadtrip Nation, a nonprofit organization, is working to change the way people approach choosing a career by creating content, products, and experiences that guide individuals in exploring what’s possible when they follow their interests. They took their first road trip in 2001, and have driven over half a million miles and made more than 30 documentaries — broadcast over 100,000 times on public television — sharing the stories and advice of inspiring leaders in all kinds of careers. Roadtrip Nation’s career discovery resources are fueled by an online archive of thousands of video interviews and stories, with personalized career exploration, educational programs for middle school through college that are accessible to millions of students, plus live tours and events all around the country. They’re the authors of four books, including the New York Times best-selling career guide, “Roadmap.” Along the way, Roadtrip Nation has benefited from world-class partnerships with great companies and foundations that have supported their mission to empower people to define their own roads in life. To learn more, visit roadtripnation.com/about. Better Make Room is a campaign within Reach Higher that celebrates and elevates the stories of Generation Z, including today’s high school and college students. Reach Higher, started by former First Lady Michelle Obama during her time at the White House, is an initiative that gives students the tools they need to go to and complete higher education, whether at a university, community college, through an industry-recognized certification, or the military. To learn more, visit www.BetterMakeRoom.org. American Public Television (APT) is the leading syndicator of high-quality, top-rated programming to the nation’s public television stations. For more than 10 years, APT has annually distributed one-third or more of the top 100 highest-rated public television titles in the U.S. Founded in 1961, among its 250 new program titles per year, APT programs include prominent documentaries, performance, news and current affairs programs, dramas, how-to programs, children’s series and classic movies. “America’s Test Kitchen From Cook’s Illustrated,” “Cook’s Country,” “AfroPoP,” “Rick Steves’ Europe,” “Chris Kimball’s Milk Street Television,” “Front and Center,” “Doc Martin,” “Nightly Business Report,” “Midsomer Murders,” “A Place to Call Home,” “Lidia’s Kitchen,” “Globe Trekker,” “New Orleans Cooking with Kevin Belton,” “Simply Ming,” and “P. Allen Smith’s Garden Home” are a sampling of APT’s programs, considered some of the most popular on public television APT licenses programs internationally through its APT Worldwide service. Entering its 13th year, Create®TV — featuring the best of public television’s lifestyle programming — is distributed by American Public Television. APT also distributes WORLDTM, public television’s premier news, science and documentary channel. To find out more about APT’s programs and services, visit APTonline.org. *This press release originally appeared on ACT’s website.